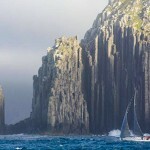 The caption in a popular sailing magazine describing this dramatic photo of the Kaiko 50 ft racing sailboat “Merlin” passing Tasmania’s Organ Pipes during the 2014 edition of the famous Rolex Sydney Hobart Race caught my attention. The fact that the photo is stunning is the first allure. The second point of interest is that this race is one of the most challenging in the world. The third, is that the skipper is 80 years young! 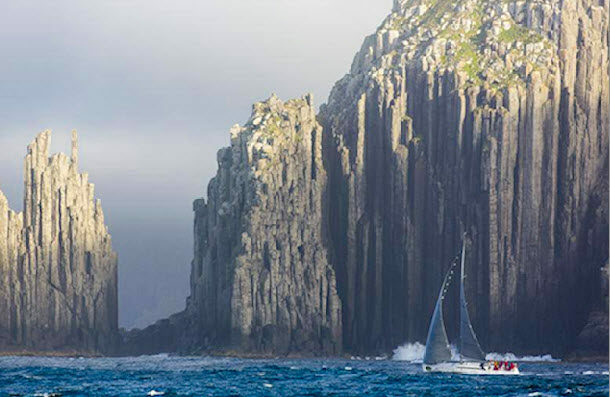 You don’t just get to show up at the docks at 80 years of age and sail the Sydney Hobart race unless you start decades in advance like David Forbes did. Your life has clarity and purpose. I heard a speaker say that the two best days in your life are: The day you were born, and the day you knew WHY you were born. What a great way to live. Knowing what you want to do, also means knowing what you don’t want to do. I lived in home backing onto a golf course for seven years. I never played the course. I knew that it would distract me from my first love. Sailing. You will gain confidence in yourself, your mates, and your tools. Last year, I circumnavigated Vancouver Island for two weeks as I added to my sailing skills and accreditation. It was a wonderful experience to build on existing abilities, and to sail with experienced friends on a capable boat. It was a platform for my next adventures. Great benefits are realized late in the race. The Organ Pipes are not to be seen until you have endured the first two treacherous legs of the race. They signal that you are in the home stretch, and that you merit the opportunity to witness the vista. Pursuing your passion for a long period will hone your skills, and take you to new heights as you mature and refine your craft. Docking is a great feeling. There is nothing like the feeling of a completing a big personal event. Knowing that you put everything you had into it makes the accomplishment sweeter. That’s how I felt recently having my photo taken as a member of the “Amazing Cohort,” graduating as Certified Executive Coaches from Royal Roads University. We had just been through the academic equivalent of the Sydney Hobart Race. The final three days together on campus was the equivalent of passing the Organ Pipes for me. Do you have the strong desire to exchange your current reality for a life of passion lived with intensity? What is your version of passing the Organ Pipes in the home stretch? A courageous coach can help you to See, Act, and Live that Vision. Life could be awesome, as early as tomorrow, and perhaps at eighty.